Part of the joy of visiting the Sanctuary was never knowing where you would find him. Would he be in the barn? Visiting the cows in the back fields? Standing behind one of the coops? Visitors were always delighted to discover where he was hanging out for the day. Bobby adored attention and would happily bend his head for a loving rub. 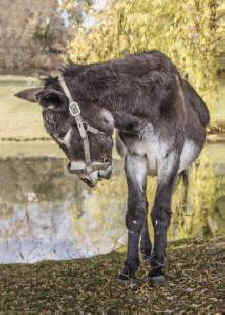 Three years ago, 47-year-old Bobby was surrendered by an elderly couple who’d rescued him from neglect. He could barely walk. “At least he’ll enjoy some comfort and peace for his final weeks,” we thought. But Bobby had other plans. With the help of supplements, expert farrier work, and a custom-molded plastic insert for one of his hooves, Bobby thrived. 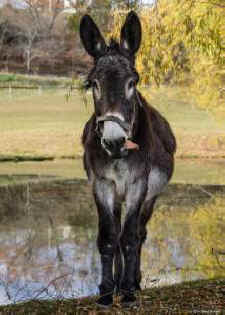 As the lone donkey in our Underfoot family, he hobbled around the Sanctuary, visiting horses, cows, sheep, and humans. He made many friends including the mares who vied for his attention. Part of the joy of visiting the Sanctuary was never knowing where you would find him. Would he be in the barn? Visiting the cows in the back fields? Standing behind one of the coops? Visitors were always delighted to discover where he was hanging out for the day. Bobby adored attention and would happily bend his head for a loving rub. And when he grew tired, he rested under one of the willow trees. But time finally caught up with Bobby. In the last months, his appetite diminished dramatically, and it was more challenging to keep him comfortable and healthy. A few days ago, Bobby lay down, and it was clear from the look in his eyes that he was done. He died peacefully, among his friends. Thank you for being one of them. Goodbye, old man. We miss you.